as a result of #1 & #2, become the go-to way for 3D creators to publish their work, and grow a fantastic community: 1.5M members, and counting. as a result of #3, become a massive library of amazing 3D content: 2.5M models, and growing. I’m so proud of the team for what we have built. We cannot thank you, our community of creators, enough. Without you we would have never made our way past #1. What a journey! The journey by emiliestabell, one of the top 3 most popular models on Sketchfab. Congratulations Alban and Sketchfab team! You did great for a 3D community made of artists, amateurs, engineers, researchers, museums and adding! Hard to imagine a world without Sketchfab now. Thanks for having the vision for 3D arts and artists. Congratulations to Sketchfab team and all the people who like this project! You made an amazing product and thanks for that. And i wish the best for all of you! 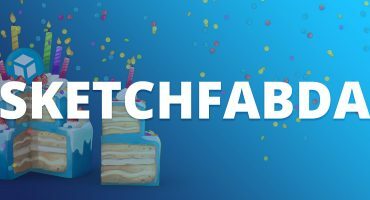 Happy Birthday Sketchfab ! And congratulations for all the members ! Undoubtedly, you have done for 3D what YouTube did for video. And that’s one hell of an achievement. Congratulations and keep up the great work. Birthday Sketchfab., today’s your day!